Why we publishing it? First bullet — everything else is at least $1,200. Update 3/28/2014 @ 1:25PM – the $640 fare is gone. Valid for travel on the sample dates above. Limited availability. JFK – GRU (Sao Paulo) – GIG (Rio de Janeiro) – GRU – JFK. Long layovers in Sao Paulo. 9,909 miles or 6.4 cents per mile. TAM will be a member of the Oneworld Alliance on March 31st and American partner. Under the existing American mileage chart for TAM, V class fares earn 100% mileage for international segments and 50% mileage for intra-Brazil flights. We believe this fare is in V class and you should earn 9,699 miles. However, this could be a non-mileage fare and/or the existing mileage chart does not apply when TAM is a member of the Oneworld Alliance. Be aware of these caveats! Support us by using our CheapOair link to book with our sample dates. 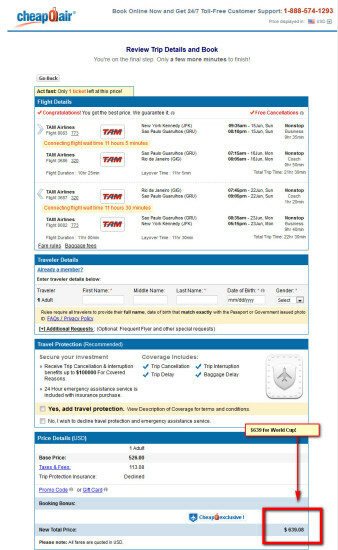 Make sure you select “More options” and on preferred airline, type in “TAM Airlines” and select my dates are flexible. * The Flight Deal will receive a small commission if you use the CheapOair, accommodation or car rental affiliate links to make a booking. Thank you for your continuing support. 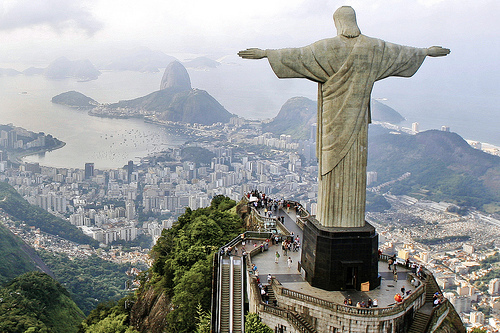 10 Responses to "TAM – $640: New York – Rio de Janeiro, Brazil. Roundtrip, including all Taxes"
You don’t think it’s actually business class do you? @Joe – its a coach ticket. this might be a mapping error, but do you see the Business Class on JFK-GRU-JFK segments? @jfkeze – its a coach ticket based on the limited fare rules on cheapoair. so it is likely a mapping error. It’s not, shows up as Z n Y on saudia website and TAM website. FlyerTalk has the post. @jfkeze – great then. we are going off the limited fare rule on cheapoair when booking. hope it is in Biz, that would be fantastic — biz + world cup. it’s a business class ticket actually. booking it and going to the saudia website shows it mapping into Z which is business. @pv_premier – ftw! and d’oh on us. if we weren’t lazy and actually did the proper research, the traffic would’ve been bananas. oh well.